I think my skills and understanding of teaching has expanded throughout this course so far because I am pushing myself to explore new lessons and techniques. Since I have taught this course before, I have been able to expand the lessons and better plan out time management. The students are responding more positively to these lessons because of the choices available for them. I have been able to use different forms of demonstrations which keeps the class interesting and not too repetitious. Overall, the growth I have found as an educator has excelled student learning. Throughout this semester (along with last), I have found how different each class is. Every class I have taught through the jail has brought new individuals, new skill sets, new and different backgrounds/experiences, etc. Therefore, I have created an understanding on how well I need to know my students in order to have them succeed. Since I have students ranging in age, ethnic background, and experience, lessons are be difficult to plan in order to involve every student. Therefore, my professional experience is has grown because I have learned that education does not only take place in a school or classroom. So far, I have been very excited to go to my P.A.I.N.T. location each week. The thing that makes me the most happy throughout this experience has been getting to know the individual. I am fortunate to go into this class blindsided by only knowing these individuals from their current state instead of their past. Even though they are currently serving time in a jail, doesn’t mean these individuals have nothing to offer for themselves, their loved ones, and the community. Therefore, helping them set goals and ambitions to succeed in and watching the students surpass them has been extremely rewarding. One thing I would like to work on throughout the semester would be working on a collaborative piece. I want the students to work as a team and get to know each other while working with a medium they are not completely familiar with. Because so many projects are individual and work with self-growth, I would like to improve relationships between one another. Throughout this course, we rotate throughout 3-4 groups. I am hoping the last week of each group we will come together and work on a large scale canvas to work as a team. I have gone out of my comfort zone in this course as an educator. I took on an internship at the jail for art therapy which is something I have never taught before. I am very interested in the topic and how art can help cope, create relationships, reflection, and personal growth. Because of my lack of experience in art therapy, my teaching experience has grown through new lessons and techniques. 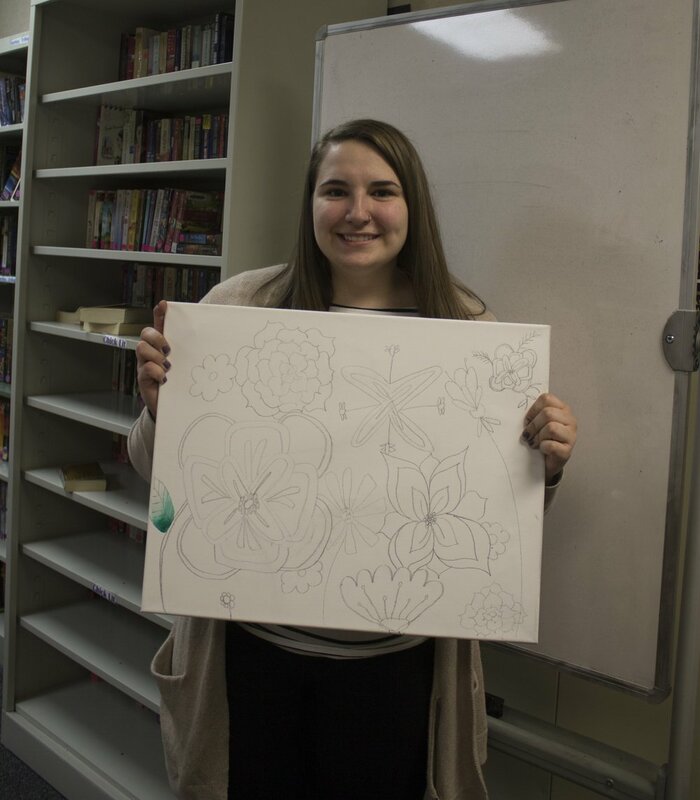 Art therapy is something that allows students to come in contact with what they are feeling. This experience has given me many different lesson plan ideas for my future in the world of art education. I have a new understanding of how to teach individuals of different ages. Most importantly, I have a new understanding of how to incorporate emotion, creativity, and reflection into lessons. This experience at the jail has helped me realize how important art is to an individual and how much art communicates about a person. Every day, these students are creating visual communication with anyone who is willing to look into the conversation wanting to be had. Each student is experience different life obstacles from each other which makes my role as an educator extremely important. I am there in hopes of guiding the students toward reaching goals. I enjoy coming in every day and seeing the students want to be in class. Being that this course is taught in the morning, many students are tired and want to be back in bed. For this class, they are ready when they walk through the door. The students love exploring new projects and have done an excellent job working throughout class and really following the project to the best of their abilities. Foremost, I am delighted to how skilled and talented these individuals are. Throughout my time teaching at the Dunn County Jail, I have seen amazingly talented drawings made from as little resources possible. These individuals are innovative, thoughtful, smart, reflective, and not to mention CREATIVE. This is the first section this semester that I have co-taught. I really want to be able to work better with my partner in teaching lessons together rather than rotating. I think we would looked at more as authoritative or the leaders if we consistently approached the class as one instead of separate. It doesn’t play a role in the discipline or content that the students are receiving, but developing a lesson with an individual is difficult and it is something I need to work on. Again, I hope I am able to work more on my classroom management skills. It seems like the inmates are so well behaved that classroom management is not as needed as it would be in a classroom. It seems like when there is an issue in the classroom I do not always handle it in the correct way. At this point in my college career, I have had quite a bit of teaching experience. I have done two practicums in different schools working one on one with teachers in order to teach elementary and high school students. At one of these districts, I completed a smaller practicum experience working with the special education department. I have also done a study abroad trip where I worked with a diverse group of students in primary and secondary schools. Last year, I worked in a P.A.I.N.T. 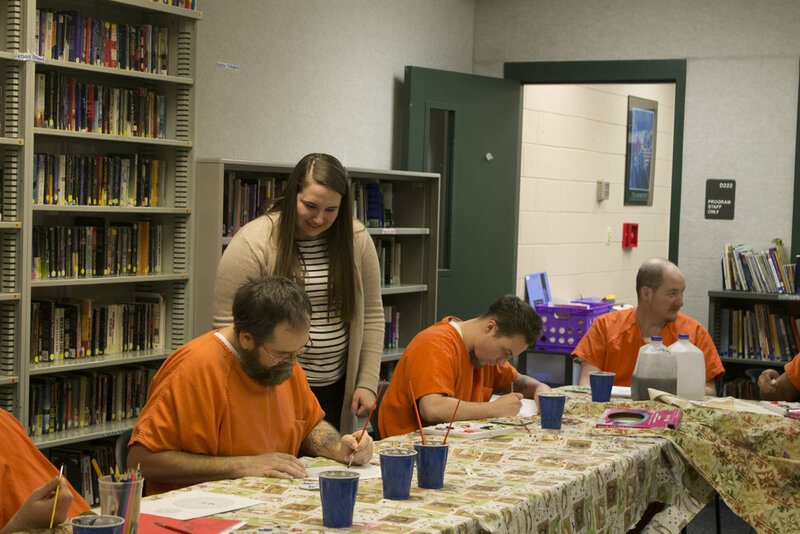 internship at the jail teaching adults watercolor. I have never taught an art therapy class before. It is something that I have always been interested in and have even considered to pursue it as a graduate degree. Therefore, I am looking forward to exploring new and interesting lessons for the students to participate in. Most of all, I am looking forward to helping the students /inmates prosper and grow as they experience different forms of self-reflection, meditation, relaxation, expression, etc. I am also looking forward to getting to know each student/ inmate. I hope to learn a different form of classroom management by teaching adults with a wide range of skills. My goals are to learn how to accommodate everyone in the class and keep each individual interested throughout the entire class. I hope to grow as an educator and a professional throughout this experience by learning more about my students and by developing compelling lessons that feed off of student choice. Overall, I hope to gain a better understanding for watercolor by finding new and creative ways to use it. I have grown in many ways throughout my experience as a teacher during my internship at the Dunn County Jail. I have gone out of my comfort zone taking on this internship because I have never been in a jail before. I found it very rewarding getting to know the students and watching them surprise me with their skills day after day. I gained knowledge of how to teach out of a classroom environment where the classroom is not designed for art related use. Most of all, I have had to use new strategies to keep the students engaged. So far I have learned that I know more than I originally thought. When I first started I was worried since I hadn’t done lessons or teaching in a while. I have also learned important things such as if you want your students to be interested in the subject matter you have to find out something they are interested in first and relate your lesson to that. The thing that has made me the happiest throughout this teaching experience was the connection I have made with the inmates. I am so interested in the people I am working with. There may be misconceptions of people who are in jail but in reality these individuals are just like you and me. These people made a bad choice which has influenced how they ended up in jail. The individuals are so excited to come to class which really has made my job rewarding. I am looking forward to getting to know the students. We as teachers are entering the classroom not knowing what these people have done to get themselves into jail. We cannot judge the inmates because we know nothing about them-we don’t know why they are in jail, who they are, what they like, nothing. By creating art, I am hoping the inmates are able to reflect on themselves and illustrate who they are to not only benefit our relationship but also to help the individual connect themselves to the goals they want to accomplish. Therefore, the thing I am most looking forward to is getting to know the inmates for who they really are as humans, not know them for their past. I’m looking forward to learning how people of different backgrounds learn differently as well as how I react to teaching people of different skill levels. I’m looking forward to learning the obstacles that come with teaching as well as learning how to get past them.